Labor is a coordinated sequence of involuntary, intermittent uterine contractions. 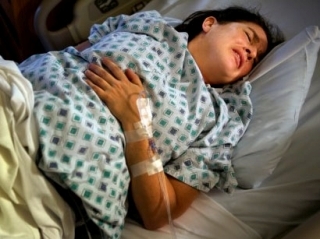 It is the series of events that expels the fetus and placenta out of the mother’s body. This is made possible by the presence of uterine contractions and abdominal pressure that push the fetus out during the expulsion period of delivery. Regular contractions result to gradual cervical effacement and dilatation. Adequate pressure from abdominal muscles allows the baby to be pushed outside the mother’s womb. Labor and delivery require a woman to utilize her coping methods psychologically and physiologically. Normally, labor begins when the fetus reaches a mature age (38-42 weeks age of gestation). This is to ensure survival of the fetus with the extrauterine life. The mechanism that converts Braxton Hicks Contractions (painless contractions) to strong and coordinated uterine contractions is unknown. In some cases, labor occurs before the fetus reaches the mature age (preterm birth) while in others it is delayed (postterm birth). Although the exact mechanism that initiates labor is unknown. Theories have been proposed to explain how and why labor occurs. The idea is based on the concept that any hollow body organ when stretched to its capacity will inevitably contract to expel its contents. The uterus, which is a hollow muscular organ, becomes stretched due to the growing fetal structures. In return, the pressure increases causing physiologic changes (uterine contractions) that initiate labor. Pressure on the cervix stimulates the hypophysis to release oxytocin from the maternal posterior pituitary gland. As pregnancy advances, the uterus becomes more sensitive to oxytocin. Presence of this hormone causes the initiation of contraction of the smooth muscles of the body (uterus is composed of smooth muscles). Progesterone is the hormone designed to promote pregnancy. It is believed that presence of this hormone inhibits uterine motility. As pregnancy advances, changes in the relative effects estrogen and progesterone encourage the onset of labor. A marked increase in estrogen level is noted in relation to progesterone, making the latter hormone less effective in controlling rhythmic uterine contractions. Also, in later pregnancy, rising fetal cortisol levels inhibit progesterone production from the placenta. Reduce progesterone formation initiates labor. In the latter part of pregnancy, fetal membranes and uterine decidua increase prostaglandin levels. This hormone is secreted from the lower area of the fetal membrane (forebag). A decrease in progesterone amount also elevates the prostaglandin level. Synthesis of prostaglandin, in return, causes uterine contraction thus, labor is initiated. Advance placental age decreases blood supply to the uterus. This event triggers uterine contractions, thereby, starting the labor.